The St. Dunstan's Quilt has been coming along nicely, in my spare time. This is an easy quilt. Every other block is a snowball block. 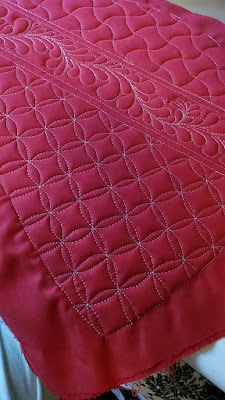 Of course, that space will show off the delicate hand quilted designs. The 54 blocks are laid out, and I will pick them up today, in a fashion that Eleanor Burns teaches. This method is so cool. That will get them off of my spare bed and when I have time, I'll sew them together. 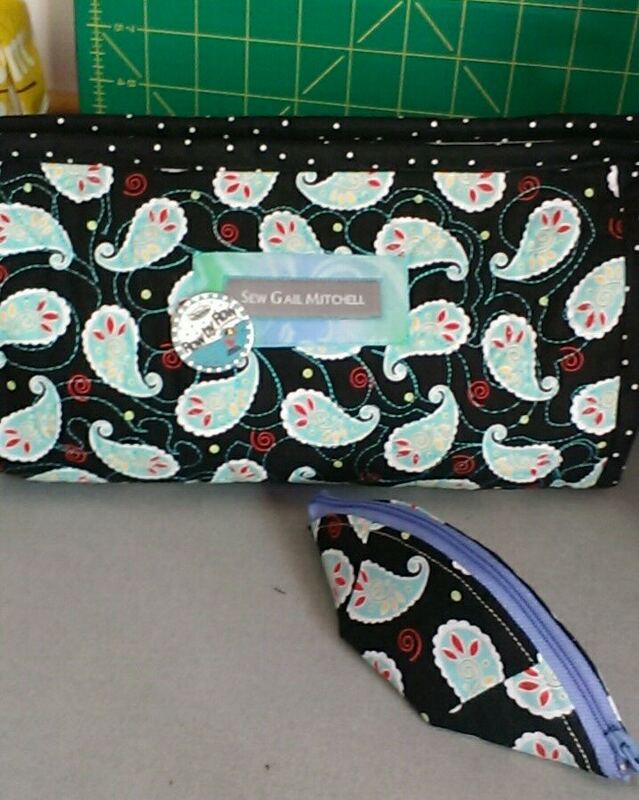 Next step is to do the two borders and make the binding. I have a busy fall planned so I'm pleased that this obligation, normally done in November, will be done. 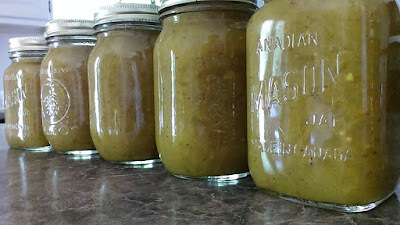 The past week has been busy with making pickles. 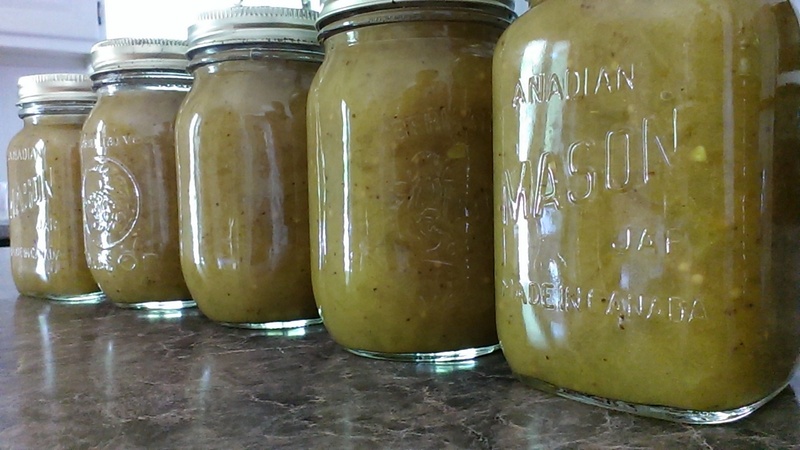 Today I made these Lady Ashburnham pickles from Linda H.'s blog. I've really enjoyed recipe for a couple of years now. Linda tells a great story behind this local pickle. I really love that they are not so sweet. When going to the market to get the produce, the vendors usually ask, "What are you making.. Lady Ashburns?" They can tell because I'm only buying big cukes and onions. So many people shorten the name. Over time, I bet most will not know the real name. We have been harvesting rhubarb, lettuce, green and yellow beans for a month or more now from our little garden. 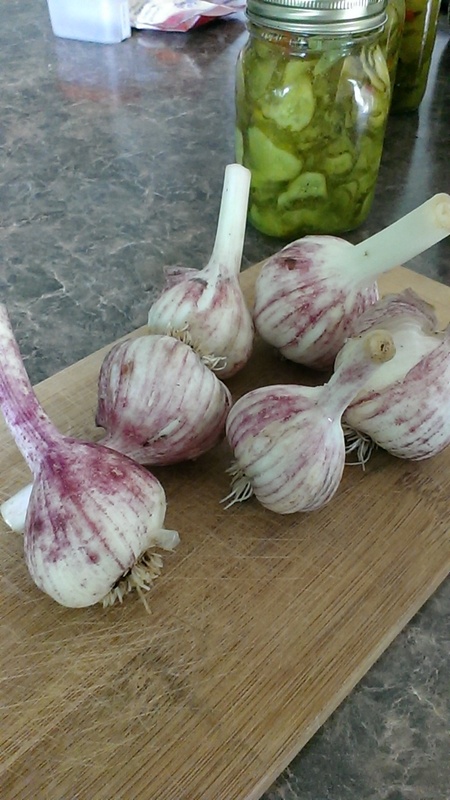 This morning, we decided it was time to harvest our garlic. It was the the first time for us. We planted it in October last year as we put our garden to bed for the winter. Since early in the spring, we have been watching it grow ever since the snow left us. The sprouts came up through about the same time as the tulips came up. In mid July, on the 3 foot skinny stalks, it was exciting to see the garlic scapes emerge and eventually curl. That is a sign that all is good and the plan is maturing. We cut them off and made a soup. The stalks had started to dry from the top, and this is an indication that the bulb growing is done and they can be picked anytime. This morning, I was a little surprised to see that there's a purple tinge to the outer skin of the bulbs. I expect that will go away when the garlic start to dry. I will save one to plant again this fall, and we will enjoy the others in some garlicky recipes soon. This is what 21 of 28 blocks needed looks like. I got these done just before Grammie Camp started. 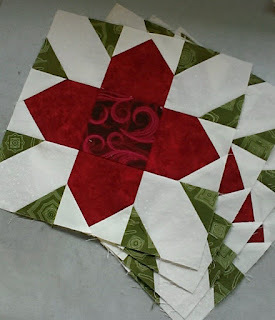 I have a busy week this week ahead, but I am sure I'll have no trouble doing the final 7 of these prairie blocks. I intend to square up all 28 blocks as well. Next week, I'll be working on the 28 snowball blocks. I had a little math problem, a couple actually. I solved one problem pretty easy... 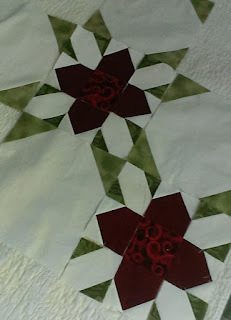 But the other one is still a mystery to me. . See, these flower blocks were supposed to be 10.5" finished. I designed the block in EQ. Turns out that they will be about 10" finished. Oh well, it's close enough. That's why I always do sample blocks. It's Day 1 of Grammie Camp. 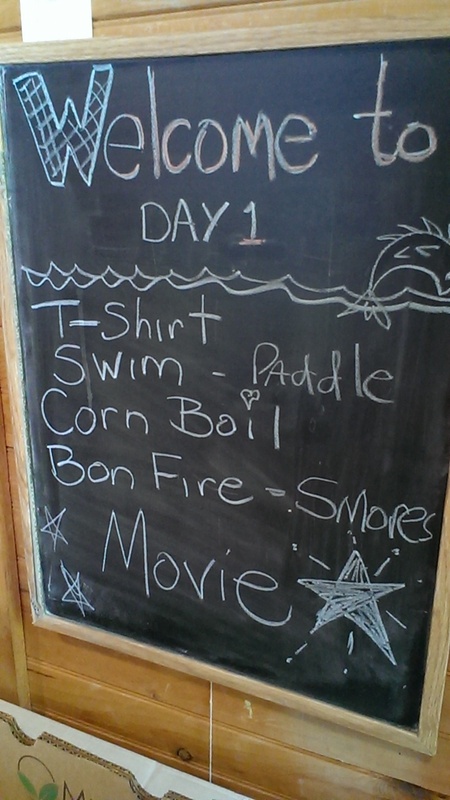 It's not supposed to be called Grammie camp any more, because we had the last official Grammie camp last year. But my hubby and I are entertaining 5 of the 6 grand kids at the lake this year. All Girls. Grampie intends to give them all personal golf instruction. We have even borrowed some lefty clubs for our lefty Jessica, and has set up his golfing net. 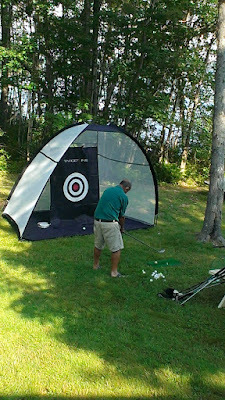 The Golf tent is up at the cottage. 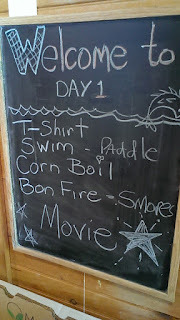 Since it's so hot today, the peddle boat and swimming may be the major activities for the afternoon. Golf instruction is on the agenda for tomorrow morning, when it's cooler. I've been working on a fun project this summer. The old Alexander Gibson Memorial School in Marysville was de-commissioned a couple of years ago. "What would they do with the school" was on everyone's mind. Well, an enterprising team bought the building this spring and has been working hard since the spring to turn the old school into a community cooperative. The name of the building is now The Ville. 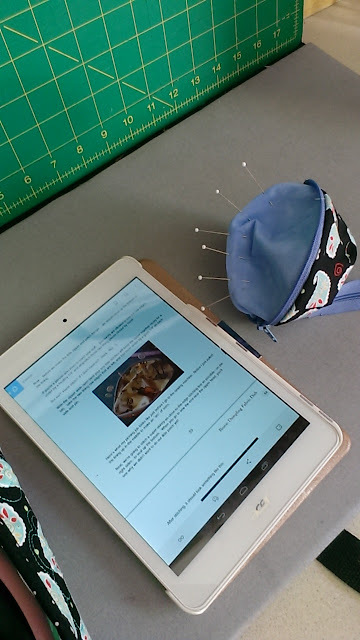 There is one classroom on the second floor that lends itself to be a great sewing/quilting workshop room. The room is bright, there are lots of outlets at table height for the sewing machines. I've worked with the team this summer to make this a comfortable room to hold sewing workshops. They painted, gathered and made tables from the surplus in the basement. I am quite impressed with their enthusiasm, excitement and energy. It's contagious. At the grand opening of the Ville, there were lots of non-sewer visitors to the Sewing Room. They all want to learn to sew. I can tell that beginner classes will be in high demand at first. Gail with Caitlin and Grace. 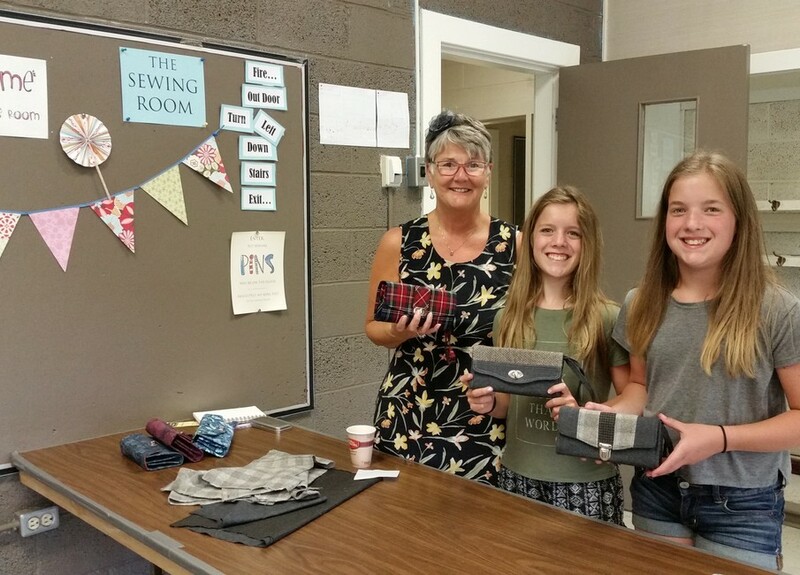 Included in the visitors to The Sewing Room last week, was Lori, the reporter from the Daily Gleaner. While Lori was in the room, my two grand-daughters just happen to come in with all the usual squeals, 'Grammie, I saw this, I saw that". Lori, the newspaper reporter snapped this picture of me with the girls and wrote a nice little piece about the sewing room. I hope you got to see Lori's article in Monday's paper. The Sewing Room is ready to hold workshops in now. The executive director Jeff, is ready to take bookings. Ph: 506-472-7799. I hope his phone rings off the hook. Although the room is ready, there are a few things that would make it just a little better. I'll list the items that are needed just in case you can help. Of course, used items are welcome. 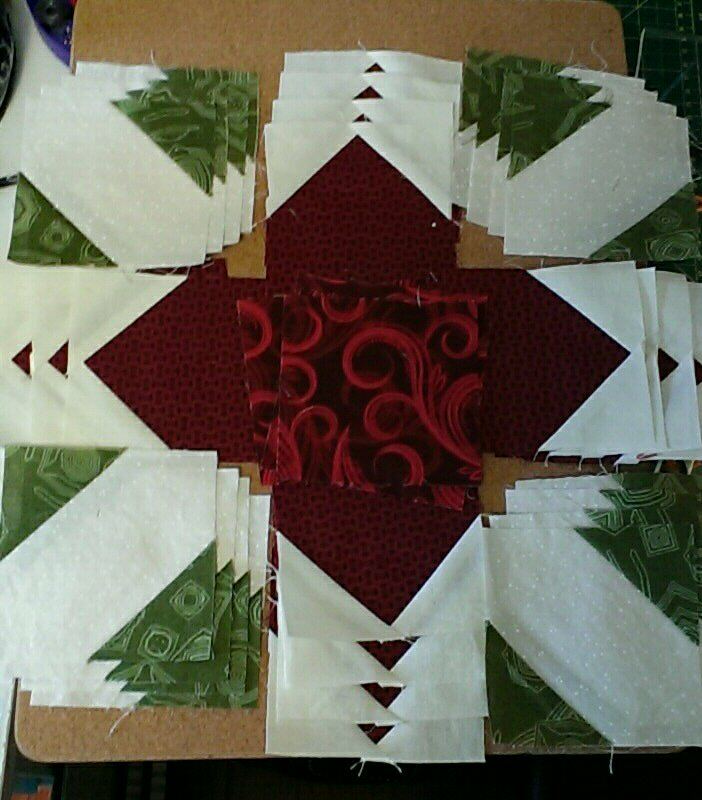 Last week, I was pulling fabrics, and preparing to kit up the St. Anthony's church Quilt. I did up a test block. There was a problem, and I adjusted my pieces. Then on a quiet day, I found myself, doing a few of the smaller component blocks. Another quiet day, a few more. Oh my, I have many of the components done now to sew the full blocks. Four of 28 prairie flower blocks done. So, why stop now.... I guess I'm officially started. New Finish Goal - end of September. 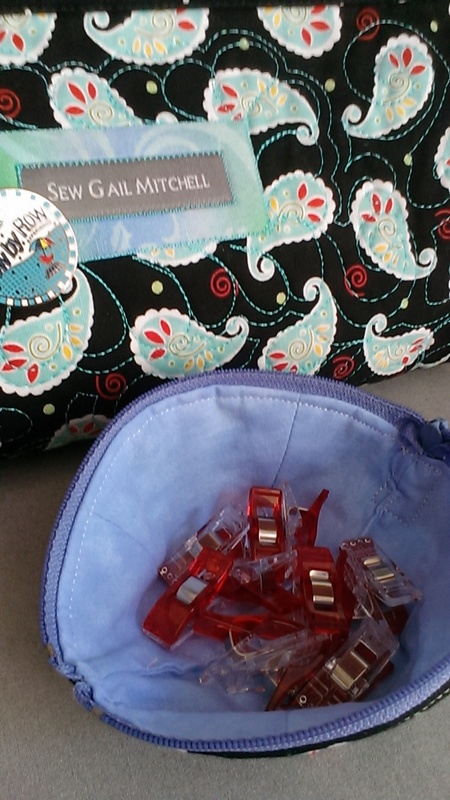 On my table - components to sew 4 more blocks. I was cleaning off the cluttered end of my ironing board the other day and came across this tea cozy that I had marked with a grid. Heavens knows how long it's been there. Since before Christmas I'm sure. Red... Tea Cozy. I expect I had intended it to use around Christmas time. 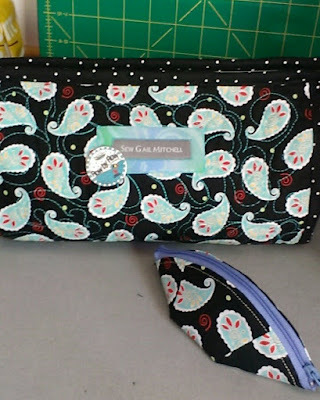 The two sides were marked and sandwiched and all I had to do was decide what grid pattern to stitch. This is the first side. It took about 10 - 15 minutes to stitch. This week, I'll do the second side which is marked different than this side and sew the cozy together. Maybe I'll call this my Christmas in July August project. 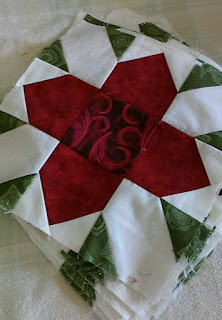 I've got the St. Dunstan's Quilters next raffle quilt on my mind. For the main part of the quilt, I've drafted up the prairie flower block in a 10.5" size, and will do snowball blocks as the alternate blocks. 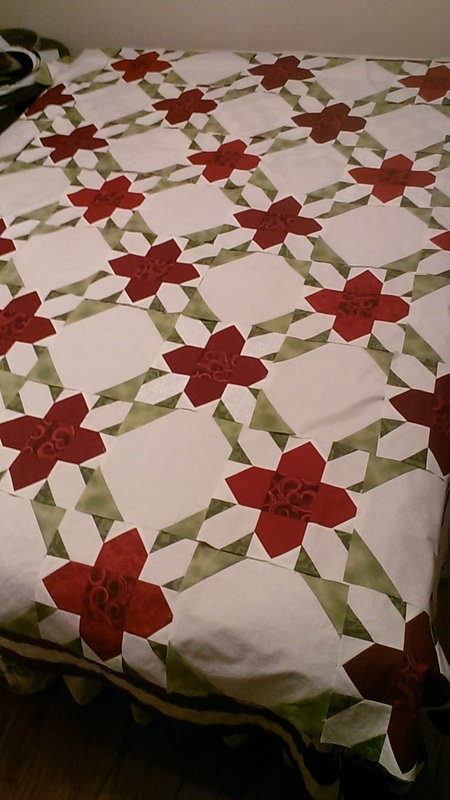 This will create an odd number of blocks across so that there are flowers in each corner of the queen size quilt. It will look like an on-point design, but it's not. These are my practice blocks. I'm glad I made a test because the points on the red flower blocks are not quite right. I'll have to add an eighth of an inch to the white corner blocks that make the point. I'll do another small test to make sure my points are right, then I'm ready to cut myself a kit. I normally do the St. Dunstan's block during the month of November. But since we are heading south earlier than normal this year, I might just start a bit early. My goal will be to have it done by the end of October. I think it's going to be beautiful. A dumpling to go with my new bionic bag that is. It's a complicated piece of work, I was working from my tablet and got to thinking, how many of my quilter friends have made a project, without the use of a paper pattern. I really see it the way of the future. Do you? It holds my clover clips.